I am trying to get some old projects done while still working on current projects. I misplaced this project almost 2 years ago. I have bags I carry around with me with half done projects in them sometimes I set them down in my project room then because they are either inside a bag and I do not see them and sort of forget about them and go on to the next project because I have so many happening at one time. The other reason is I do a play and forget because after a month of crazy costume making for others my mind just sort of forgets what I was doing for myself because of other projects that are bigger ie.. a play and have deadlines that my mind is to tired to remember. But in the case of this item it was actually the fact that I was doing the last touch ups on my book "learn to do yo-yo crochet" that put this on the back burner for what would seem like forever. Then when I go back to work on them I don't remember where I set them down last. This is one of those. I can tell just glancing at it that I have mistake in one of the gloves ( the first one) but because it is done I will frog the second one and make the same mistake in it. Sounds weird but I remember why I did it on the first one was because I did not like the floating tree so I changed it. On the second I was just following the pattern and not paying attention to what it looked like. 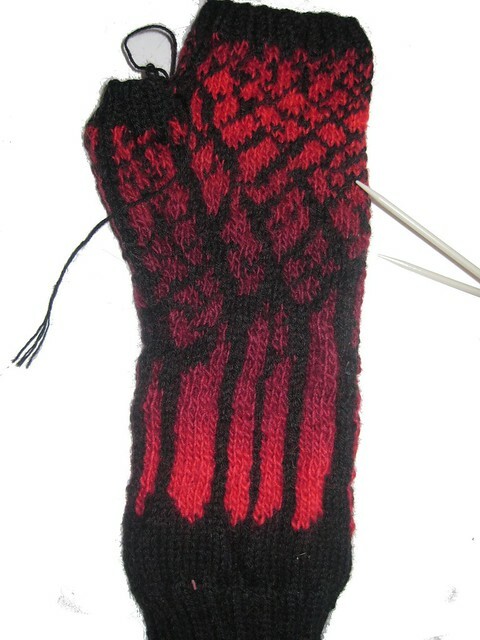 The first glove just needs its tails woven in and it would be finished. 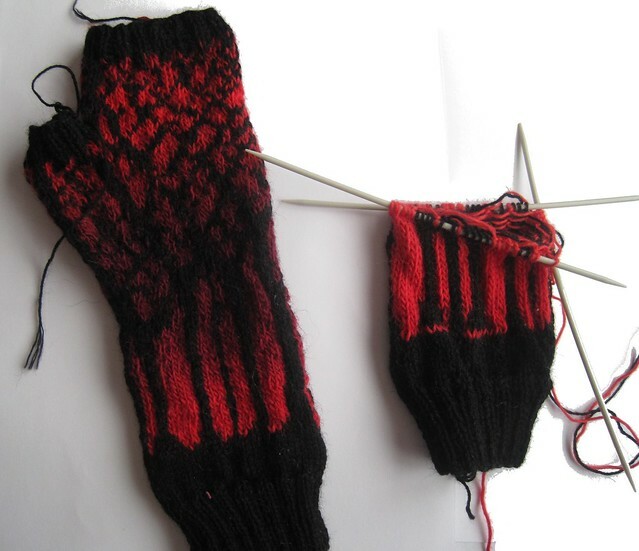 The nice thing about misplacing projects is when you get back to them you can either see mistakes and fix them or you don't have much left and it is almost instant gratification.The pattern is available for free if you want to make a pair of gloves like these from this site.